By Jennifer Ferrara, Guidance Counselor ES International School, Barcelona. 1258 kilometers of driving, 10 universities, 6 northeastern states and 111 tennis matches. We have just returned from the annual ASC-ES International School University Trip. This is not a typical university trip. Ours reflects exactly who we are – in both mission and values — as a tennis academy and a school; we tailor our trip to the unique needs of our student-athletes from both our Barcelona and Florida campuses while providing them with the invaluable opportunity to visit universities while playing ITA (Intercollegiate Tennis Association) tournaments as well as the Donovan Show Case Event at Yale where over 80 men’s and women’s coaches watch them play. The Barcelona contingency left for the US the day immediately following our graduation ceremony. Four student-athletes who are all rising seniors got on a flight to Philadelphia with me. Once we arrived to Philadelphia (after considerable delays) we just managed, through our first athletic feat of the trip, to make our connecting flight to Boston. 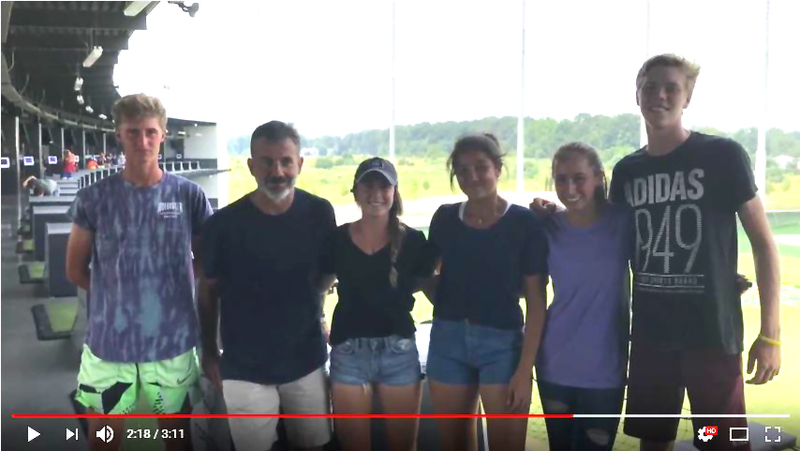 Meanwhile, the Florida cohort, five student-athletes traveling with Simona Bronzetti, had left the Naples campus to meet us in Boston later that night. Exhausted and excited, both the Barcelona and Florida campuses finally arrived at our hotel, outside of Boston, around midnight. Wasting no time at all, the next morning at 9:00 we were already on the Boston College campus taking in facts while admiring the gorgeous gothic architecture, climbing many steps, exploring the Wizard- of-Oz-inspired Fulton Hall which houses the Carroll School of Business and trying to wrap our minds around what time zone we were in. After a few hours on the BC campus, our nine students – all being dedicated student-athletes – hit the courts in a local park and got in a high-energy practice session. Later that afternoon, we ventured to Cambridge and spent time in bustling Harvard Square. We also had a brief tour of the campus and learned about the oldest library system in the US and the third largest in volumes, behind the Library of Congress and Boston Public Library. Our minds sufficiently reeling as we considered just how many books that must mean, we took our decidedly tired and still jet-lagged selves back to the hotel for dinner. Up again early the next morning, we set out for Stonehill College in Easton, Massachusetts where we had an information session with admissions, lunch in the campus dining hall with both the men’s and women’s tennis coaches and a full tour of the bucolic campus and the impressive sports facilities. No sooner did we end our tour of Stonehill then we were in the car headed to Bryant University in the state of Rhode Island. 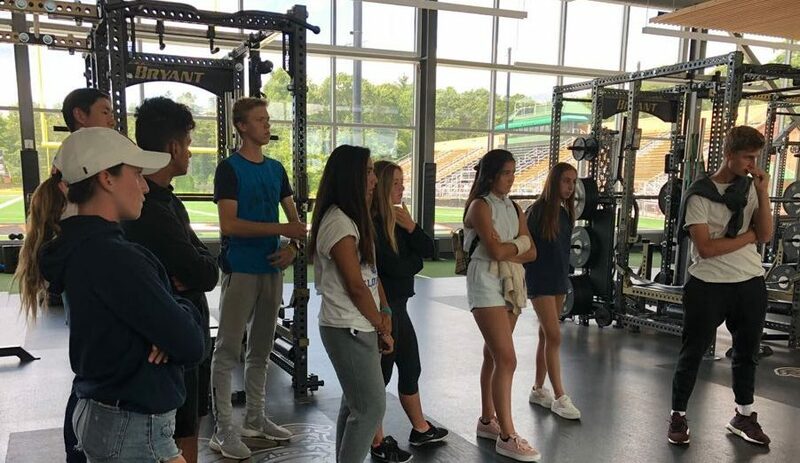 One of our alumna from the graduating class of 2017 just finished her first year there and the women’s coach was more than happy to provide us with a tour of the modern campus – complete with a full information session with one of their fitness trainers. We were really hoping to meet the school mascot, a real bulldog named Tupper; however, he was working his summer hours and had the afternoon off! Once we finished our tour of Bryant, we drove to New Haven, Connecticut. Early the next morning, we went to visit Fairfield University where we had an information session and a guided tour. 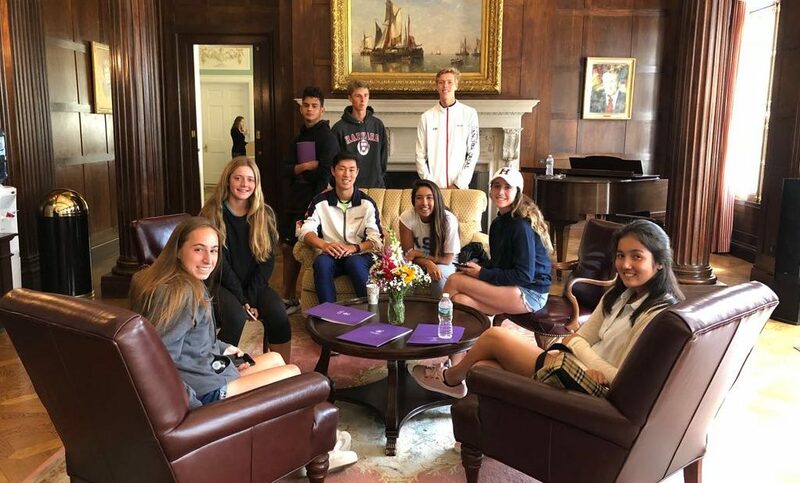 The tennis coach also spent time with the group and our tour guide was a varsity athlete – an articulate and good-humored swimmer from New Zealand. We all found Fairfield to be a gorgeous campus and we were impressed with the facilities and the people we met. After Fairfield, we headed to the stunning campus of Sacred Heart University where we had lunch in the dining hall, a great tour with an exceptionally informed student from India who filled us in on many aspects of SHU life and showed us the amazing dorms! We then had a wonderful information session with the tennis coach. We were also incredibly lucky because we met the Athletic Director who is none other than baseball great: Bobby Valentine. After our two tours, the kids practiced in a nearby park and prepared for the next day which was the first day of the Donovan Show Case at Yale. That evening, Emilio Sanchez Vicario joined us and remained with us for the rest of the trip – coaching the kids with his passion, wisdom and humor while keeping us all entertained with his fascinating stories of his time on the ATP tour. That night, we had a protein-rich steak dinner and headed back to the hotel for a good night’s rest. Bright and early the next morning we headed to Yale’s tennis facilities where the girls would begin playing the Donovan Show Case. The energy was palpable as girls from all over the world and university coaches from all over the country checked in and looked at the draws. Rules were explained, water bottles were filled, first-round matches were called onto court – coaches swarmed and took notes while girls battled it out on court to show their tennis prowess! Food trucks were on hand for quick meals in between matches. Meanwhile, the boys were training with Emilio and preparing for the next day when they would begin the show case. The next day brought rain so all show case matches were played indoors at the gorgeous Yale tennis facility. There are few sounds as gratifying as tennis balls being hit on indoor courts – the acoustics render every shot powerful and thrilling. Despite the humidity and the nerves associated with such an important event, good humor and positive energy were abundant. Day three was the final day of the show case. Emilio stayed at the show case while the boys finished their matches and I took the girls to visit Quinnipiac University. We had a great campus tour with the women’s tennis coach and we were all awed by the beauty of the campus and the amazing facilities. We particularly loved the library and the hockey arena. By 5:00 that afternoon, all ASC-ES International School students had finished their show case matches and left their mark. It was time to move on. We piled into the cars: luggage, rackets, kids, music, snacks and a full tank of gas in our vehicle, affectionately named “Petunia.” We were prepared for the drive to New Brunswick: the destination of the first ITA tournament at Rutgers University. Driving from New Haven, Connecticut to New Brunswick, New Jersey via the Bronx and the George Washington Bridge late on a Friday afternoon right before the July Fourth holiday brought its challenges – namely the four plus hours we spent in very heavy traffic. We had an eclectic mix of music, conversation both silly and profound, snacks both healthy and junky and attempts at sing-alongs to keep us motivated. Finally, as we passed over the GW Bridge and caught a glimpse of the sun-bathed NYC skyline that my students had only seen in the movies, there was hope. Real hope. We knew we had nearly arrived to our destination. The next three days were spent playing the ITA tournament in the blistering and unforgiving heat at Rutgers University where ASC claimed titles in the boys’ doubles, boys’ singles and the back draw of girls’ singles. 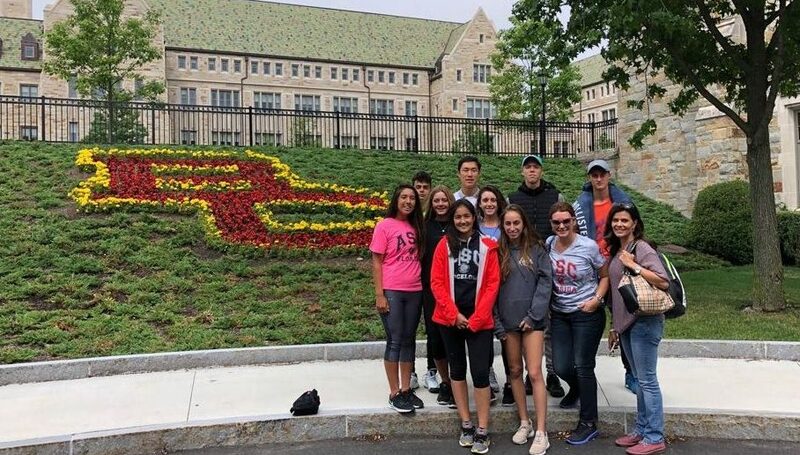 We incorporate the ITA Summer Circuit tournaments into our annual ASC-ES International School University Trip because they are a great opportunity to play against current university players on campuses around the country. Our student-athletes are able to connect with players from a variety of universities, ask them questions and understand a bit more about the lives of varsity athletes at university. We were awed by the athletic facilities at Rutgers and the size of the campus. It was by far the largest university we visited and it gave our student-athletes a good idea of what a campus that serves 30,000 plus undergraduates looks like. The day after the ITA tournament at Rutgers, I returned to Barcelona and the student-athletes continued on to Florida with Emilio. They arrived in Naples and trained there (and celebrated the 4th of July on the beautiful Naples beach!) until they left for the second ITA tournament at Warner University. No strangers to heat and intense play, our ASC players once again did well. Our boys made it to the finals in doubles and one battled and had a great loss in a three setter in singles’ quarter finals while one of our girls made it to the final of the back draw in singles. While I have provided the outline of our trip and the facts about where we went and what we did, I have not even begun to tap into what is the heart or essence of the trip – what it is really about. The trip is one of the defining moments for our ASC-ES International School student-athletes. It combines what they have been working toward and what they are seeking to do as elite student-athletes. It demands immense poise and unrelenting perseverance from each of them. It tests them and pushes them to be the best version of themselves both on and off the court. Just as tennis prepares our young student-athletes for the world with the transferable skills and the values they learn, so too this trip serves the same purpose – a microcosm of what we do day in and day out throughout their training and education at ASC and ES International School. As their Guidance Counselor, it is rewarding to work with them through the intensity of this trip on their way to self-realization in the process of university placement – conversations, ideas, exploration, victories, disappointments, wins, losses, laughter, tears, discovery and evolution. It all happened in this tiny little space of time over the course of 1258 kilometers, 10 universities, 6 states and 111 tennis matches. Thank you very much to Daniela Garcia Romanos for her nice video about the trip! 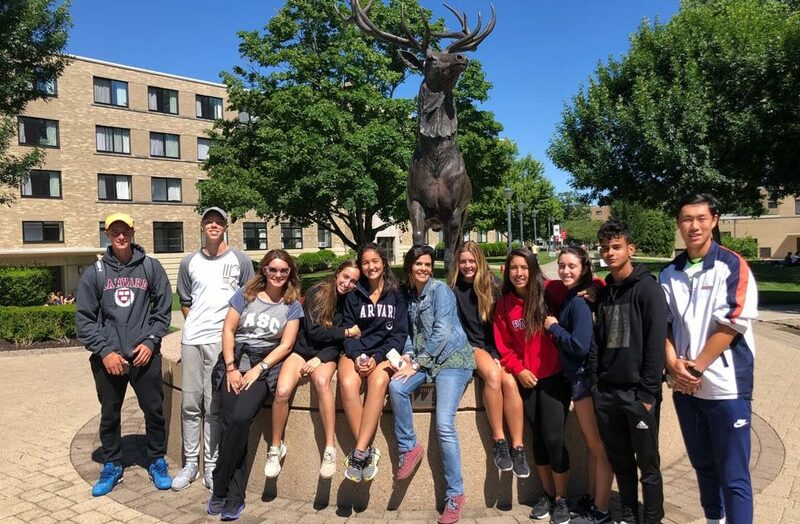 This entry was posted in Education and tagged Academics, College Placement, Emilio Sanchez, High-School, Leadership, Naples Florida, Sánchez-Casal Academy, Sánchez-Casal Alumni, Sánchez-Casal stories, scholarships, School, Spanish Tennis, Studies, Tennis, tennis academy, Tennis players, University, US tennis. Bookmark the permalink. ← MY EXPERIENCE AS AN ASC STUDENT-ATHLETE AND NOW… COACH!